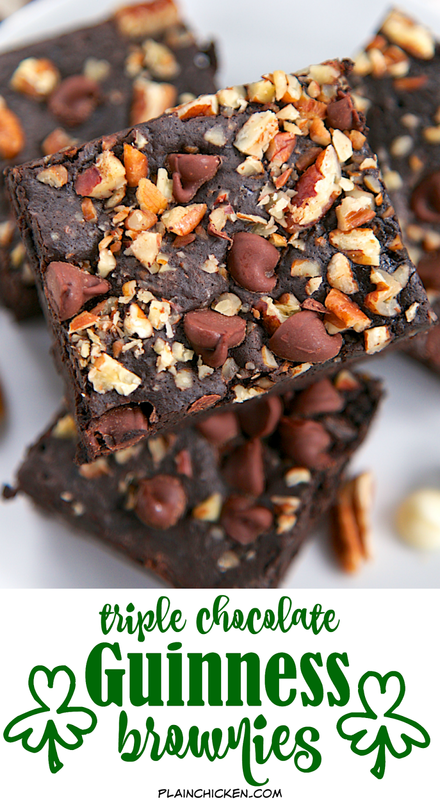 Triple Chocolate Guinness Brownies - super rich and fudgy brownies loaded with dark chocolate, white chocolate and semi-sweet chocolate. Super easy to make - they are ready for the oven in minutes. Serve warm with a big scoop of vanilla ice cream! They were a huge hit in our house! 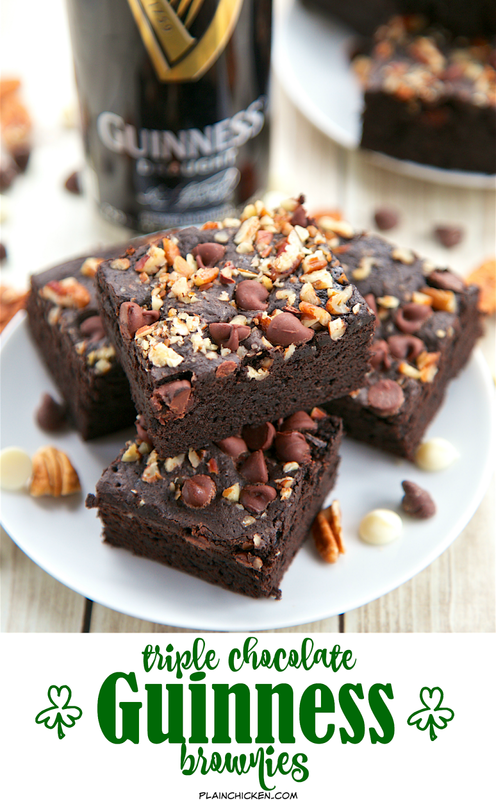 These Triple Chocolate Guinness Brownies are a chocolate lovers dream! There are three types of chocolate in these brownies - dark chocolate cocoa powder, white chocolate chips and semi-sweet chocolate chips. Chocolate overload!! 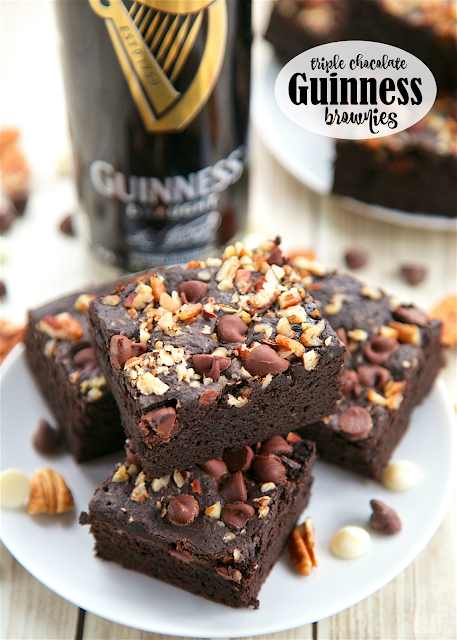 What really puts these brownies over the top is the addition of Guinness beer. SO good! The brownies were super rich and fudgy. Perfect in our opinion. These brownies are very simple to make. There is no special equipment and they are ready for the oven in minutes. I topped the brownies with some chopped pecans. 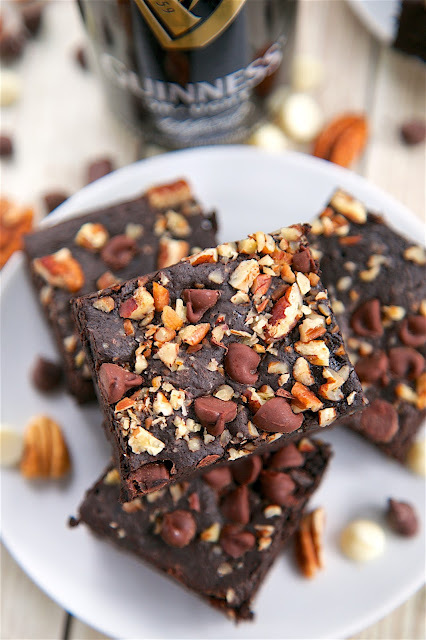 You can certainly leave them off if you aren't a fan of nuts in your brownies. If you don't like pecans, you could use peanuts or walnuts. 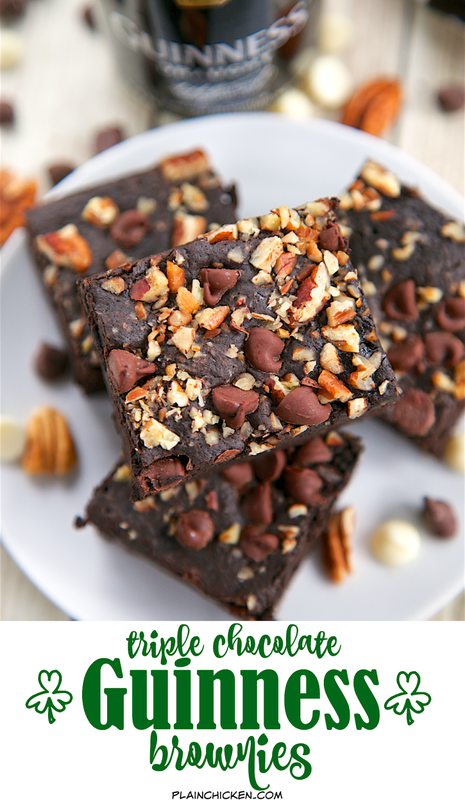 Feel free to top these Triple Chocolate Guinness Brownies with some green sprinkles to liven up your St. Patty's Day celebration! Preheat oven to 350ºF. Spray a 9x13-inch baking dish with cooking spray. Whisk flour, dark cocoa powder, and salt together in a bowl. Set aside. Melt 1-1/4 cups semi sweet chocolate, white chocolate chips, and butter in microwave on 50% power in 30 second intervals until melted. In a large bowl, beat sugar and eggs together with an electric mixer until light and fluffy, about 3 minutes. Add melted chocolate and beat until just combined. Slowly add flour mixture, and mix just until combined. Whisk in beer. Pour batter into the prepared baking dish; sprinkle chopped pecans and remaining 1 cup of semisweet chocolate chips over batter. Bake 25 to 30 minutes. Remove from oven. Cool to room temperature and cut into squares.